Malaysia Building Society Bhd (MBSB), which is optimistic about the property market in Penang, plans to finance more development projects in the state. MBSB president and chief executive officer Datuk Ahmad Zaini Othman said the group had so far financed RM1.3bil for seven projects in Penang over the past 12 months, of which two were in Seberang Prai and five on the island. “The property prospects in Penang, especially on the island, still look strong. There are property projects on the island which were 60% sold two weeks after the launch, according to feedback from local developers. “There is strong demand in Penang particularly for properties priced from RM350 per sq ft onwards. 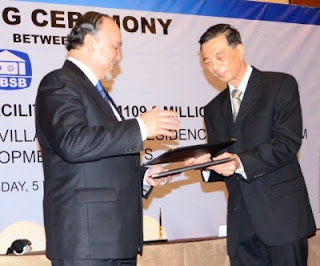 “The challenge in Penang is to come out with the right products for the customers,” he said after signing an agreement with Geo Valley Sdn Bhd chief executive officer to provide RM109mil financing for its two projects Pine Residence Condominium Development and Pine Sanctuary Semi Villas. Also present were MBSB chairman Tan Sri Abdul Halim Ali, Geo Valley executive chairman Dr Zainol Che Mamat, Geo Valley chief executive officer Ooi Boon Seng and Geo Valley general manager (marketing and corporate affairs) Mabel Ooi. Ahmad Zaini also said that MBSB wanted to work with developers which had good reputation and track record in delivering projects on schedule. Mabel said the RM109mil would finance 288 units of three-storey villas in the Pine Sanctuary Semi Villas project and 222 units of Pine Residence Condominium. Both projects are located in Paya Terubong, which is about 9km from here. “About 60% of the Pine Residence Condominium has been sold since the launch in mid-2012. “The units with built-up areas of 1,500 sq ft to 1,674 sq ft are sold at RM350 per sq ft to RM400 per sq ft.
“The Pine Sanctuary Semi Villas will be launched in either March or April,” she said. These guys always walk few steps ahead of every body else in property sales market. This is the secret of their success.